Use Zirconia and Alumina Power Pressed into Knife Billets with the Mould and the Weight of 300 tons,2000 Degrees Centigrade Sintering, 10 times Sharper than Steel Knife. High Hardness, High Density, High Temperature Resistant, Magnetic Resistance, Oxidation Resistance and High Quality ABS + TPR Material of the Handle, Unique Non-Slip Design. 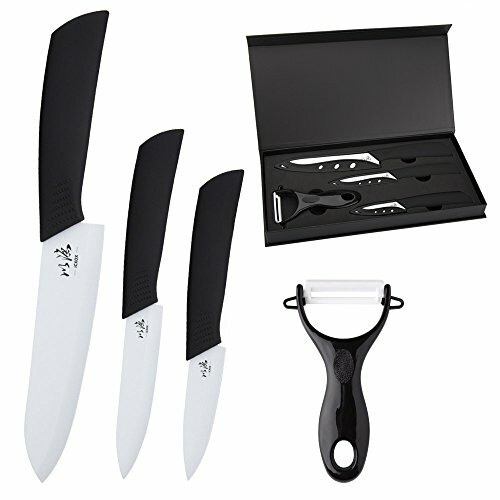 Three Different Sizes Knife are Available,Attached Gifts of Fruit Planing and Knife Sheath. Don\'t be Used to Cut Bones and Hard Objects and Keep Away From Children. Any Item Found Defective (Non-Artificial Damage) will be Repaired or Replaced without Charge, We Fully Protect the Consumers\' Rights, For the Damage Caused by the Improper Operation, We will not Provide Free Return or Exchange.